I wasn’t doing anything specific this weekend, so I thought I might go for a wander around Te Kopahou Reserve. This is the area that includes the hills above Red Rocks on Wellington’s south coast, as well south of the radar dome belonging to the Airways Corporation. It’s very accessible and I’ve been there a few times before, but I think this is the first time I’ve written anything about it. I got around the reserve in about 3 or 4 hours, and spent the rest of the day walking around the coast to Seatoun. I currently live in Brooklyn, and started from the Brooklyn Shops, walking up to the Karori Sanctuary fence, and following it south to the Brooklyn Wind Turbine. From here I continued to follow the fence for a while until it turned off to the west, then I hopped over to the sealed private road to the wind turbine. Shortly before the radar dome there’s quite a weirdly-placed castle-style building, and it’s been there for at least as long as I’ve known the area. Today it had an Italian flag flying above it — I’m unsure what the relation is. The other thing about this building is that the highly-fenced property always has at least two very noisy dogs inside, and they bark continuously at anyone and everyone who approaches. They were as noisy as ever today. I’ve never actually seen any people inside that property, but I suppose the dogs don’t feed themselves. There’s a small out-cropping from the road shortly after this building, about 100 metres before a couple of marked tracks turn off on the left. I climbed up for the view, and spent a couple of minutes checking my map, because there’s a nice looking spur going down from there. After considering it some more though, it looked more and more as if the spur went down to the landfill below, which I didn’t really want to end up at, so I left it and kept going past the Radar Dome. I think this is only about the second time that I’ve continued past to Te Kopahou, which is a 485 metre peak above the south coast. The first time was a couple of years ago and it was very windy, but this time was a lot calmer. Looking west from the ridge, there was a very clear view of the South Island, including some very snow covered mountains in the Kaikouras. I don’t know the peaks well enough to be able to say which they were, but they were on a bearing of about 230 to 235 degrees from the top of Te Kopahou. There’s only one clear way down from Te Kopahou that doesn’t involve crossing private land, which is to follow a four-wheeled-motorbike track down a spur to the south, eventually zig-zagging and sidling down about a 400 metre drop to the Waipapa Stream below. Once there, you can either return the way you came (get real), or follow a track up to the top of the ridge on the other side, about another 200-250 metre climb. (Looking at the map, it may also be possible to follow the stream out to Red Rocks on the coast, but I’ve never tried this.) On the way down, it’s possible to turn off on a side-route towards some WW2 bunkers which were used as sighting posts to radio back targeting information to the gunners, should any evil submarines or ships be spotted off the coast during the war. I didn’t bother this time, since last time I visited I remember the track down to the bunkers being very steep and almost scree, and quite tiresome to climb back up on the way back again. It was worth a look once, though. 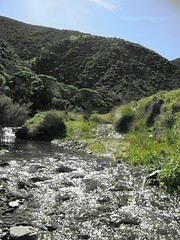 There are actually a couple of ways up the spur on the eastern side after reaching Waipapa Stream. The first goes almost straight up from the stream, and it’s only necessary to jump over the stream once. What I did though, was to follow the track east along the stream for about another 300 metres, before it climbs up the side of the ridge. It’s quite a nice (but short) stream walk. I managed to keep my feet dry this time, but the last time here I remember being ankle-deep a couple of times, as the track crosses the stream four or five times in those few hundred metres. The forecast wind for today was a northerly, and as I walked along the ridges I was actually expecting to detect the sweet decomposing scent of the Happy Valley Landfill wafting over the hilltops, which I’ve noticed a few times in the past. This didn’t happen today though, and it might have just been because the wind was so lacking. I continued north-east along the ridge, and eventually reached a point where the track sidles around the inside of a 292 metre peak. 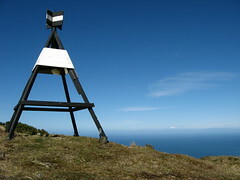 There was a post marker to mark the track changing direction, but it was obvious that there was a less official track going up to the top of a peak. I followed it up, on the assumption that it was just an alternative way of getting to the same place. After a couple of minutes though, it became clearer that it was heading off in a completely different direction to the more official track. Basically the other track, which is overgrown in places, heads from the unnamed 292 metre peak over a saddle in a south-south-east direction, towards the top of the Owhiro Bay Quarry. I was busy taking a bearing on the radar dome in the distance to verify where I was, and checking my map, when a guy on a mountain bike turned up and asked me if I knew where the track went. He’d seen me in the distance and decided to follow me, and he didn’t have a clue exactly where it went either, but the map indicated that there weren’t many places it could eventually reach besides the Red Rocks parking area, which we could see below us. He was quite confident and kept on riding, and meanwhile I decided that if I came across him pushing his bike back up the hill, I’d just take the hint and turn around. After a few minutes, the track became more of a bulldozer track. 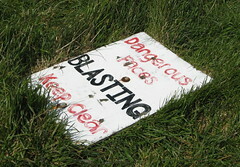 I passed a old danger sign that had been pushed over warning of blasting in the area, although it didn’t look up to date and it didn’t seem likely there would be any such danger today. Eventually as the track descended, it became clearer that it was zig-zagging down the quarry. Within about 20 minutes or so, it reached a level terrace about 3 metres above the main plateau near the sea level, which unfortunately didn’t have any obvious way down. After walking back and forth for about 5 minutes, I eventually found quite a dodgy slope with some relatively stable rock, and managed to lower myself down, ending with a bit of a run down some scree onto the flat. I don’t think I’d want to do that again. I never figured out where the guy on the mountain bike came down, but I didn’t trip over any corpses so I assumed he found a way. It might have been that the bulldozer track had forked off somewhere else earlier and I hadn’t noticed. By now I was at the bottom of the quarry, 5 minutes walk from the Red Rocks parking area. It was roughly 12pm, so it’d taken about 3.5 hours to get this far, and for the first time there were lots of people around. Basically I spent the next 3 hours walking east-ish around the coast… through Owhiro Bay, Island Bay, Te Raekaihau Point, Lyall Bay, past the airport, and then onto the Coastal Walkway around Tarakena Bay, a bunch of other bays, Breaker Bay, Point Dorset, and around the corner to Seatoun. It was interesting in terms of walking along the coast, but generally in involves a lot of road and footpath walking, and wasn’t nearly as eventful. Seatoun had been about the point that I’d focused on since I left in the morning, and I’d lost the motivation to really go much further. Consequently, I jumped on a bus back to Newtown at 3.20’ish, and walked back to Brooklyn over Bidwill Street. It wasn’t a bad day in the end. This entry was posted in daywalk and tagged daywalk, independent trip, te kopahou reserve, wellington. Bookmark the permalink.